“You never get used to it,” sighs Ward. He may not get the chance. 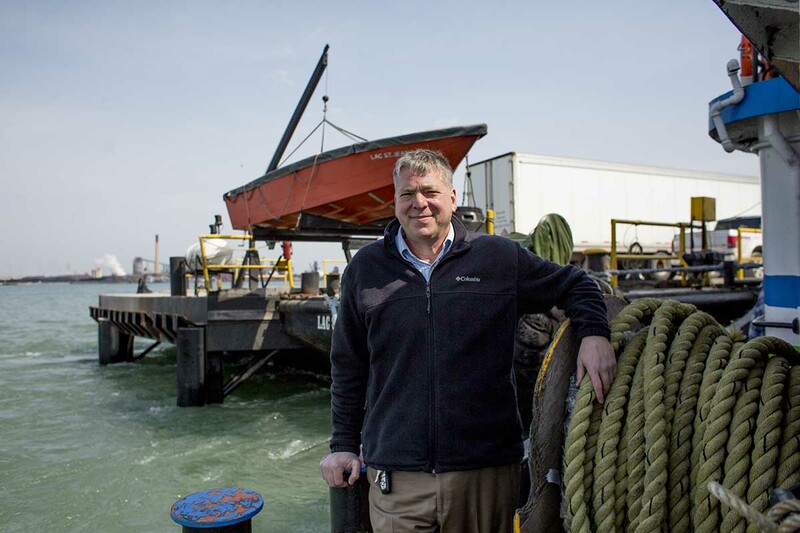 Ward owns the Detroit-Windsor Truck Ferry, a barge that carries trucks loaded with hazardous materials – paints, solvents, whiskey and acids – across the Detroit River. It will soon become obsolete and close when the $4.5 billion Gordie Howe International Bridge to Windsor opens in about four years. But for a man with a dying business, Ward sure seems happy. He says he’s at peace with his fate, so long as the new bridge benefits the public and not his nemesis: Manuel “Matty” Moroun, who owns the 88-year-old Ambassador Bridge just to the east. “A new bridge is out of my control, but it’s a good project that makes all the sense in the world,” says Ward, 57, of Dearborn. But some in the path of the bridge are not nearly as thrilled. There’s the Moroun-linked company that owns the Ambassador Bridge, of course. The company, which proposes to build its own, parallel span, is suing the state of Michigan to block condemnation efforts of 20 parcels necessary for the Gordie Howe bridge, which Canada is funding. The project can't proceed without that land. And there are other business owners in the footprint of the bridge, as well as neighbors of surrounding properties, who say the process hasn’t always been smooth. “It’s very difficult to do a project of this magnitude, with all the governments involved, and expect everyone to be perfectly happy,” said Jeff Cranson, spokesman for the Michigan Department of Transportation. The border crossing is the busiest in North America one of the richest in the world, carrying some $340 million in trade daily. Officials on both sides of the border have lobbied for a new bridge for at least 20 years, citing traffic snarls, security concerns, the age of the Ambassador Bridge, and ongoing headaches with its private owner. Ward has feuded with Moroun since 1990, when he began his barge business, which is reportedly the only one of its kind. The grudge may last longer than the Delray neighborhood that binds them. Once the home of Hungarian immigrants, the slab of forlorn land hugging the river in Southwest Detroit is changing by the day. Just outside the footprint are ramshackle homes with small yards filled with junk. They will stay. “Welcome to America,” Ward says. All told, 229 homes and 88 businesses will be condemned through eminent domain, according to the Windsor-Detroit Bridge Authority, the government agency overseeing the construction of the Gordie Howe bridge. Some 95 percent of U.S. properties required to be moved for the new bridge have been purchased, and construction contracts should be signed in September. A few holdouts remain, including Moroun. The lawsuit over the land is due to be heard in July in Wayne County Circuit Court. At a forum last month, Gordie Howe Bridge officials said they aren’t worried. “This project isn’t going to happen. This project is happening,” Heather Grondin, vice president of communications for the Windsor-Detroit Bridge Authority, told about 50 residents in Southwest Detroit at a community meeting. About a dozen businesses remain in the footprint of the bridge in Delray, and more are leaving every week. Most aren’t getting enough for their land, contends attorney Alan Ackerman. “Matty made it tough. No doubt,” said Ackerman, an attorney for about 14 businesses that have been condemned by the state for the project. Ackerman’s clients include Gordy Ebsch, the owner of Delray Mechanical Corp., an industrial welding business the state condemned in July. Ebsch wants to temporarily relocate and then move back to Delray to service bridge construction subcontractors. Planning how to make that happen consumes 18-30 hours per week. “I’m not whole. Not when you are offered less than you paid for it 20 years ago,” he said. Cranson, the MDOT spokesman, said state law sets the standard for compensation and caps it at 125 percent of appraised value. He noted that hundreds of homeowners and renters in Delray already have been paid (through Canadian funds) and relocated. Andrew Doctoroff, a senior special projects adviser to Gov. Rick Snyder, said he "knows of no similarly situated property owners on the other side of the border who were treated better than" those in Detroit. He said state officials are "bending over backwards to preserve jobs and ensure businesses that can relocate." A separate program administered by the City of Detroit (and also funded by Canadians) aims to entice occupants of 350 homes surrounding the Gordie Howe Bridge to relocate. Unlike Windsor, Detroit has attached conditions to the program that allows residents to receive a city-owned home in another Detroit neighborhood. The program is worth up to $60,000, but residents must be current on their taxes and water bills. The effort was launched this year, and so far no residents have relocated. “They’re not really telling anyone anything. They should be knocking on doors to get us out of this neighborhood,” said Robert Dzbankski, a former disc jockey who says he’s been disabled since he was in a motorcycle crash caused by a drunk driver. Some homeowners have been matched with homes even though they have yet to relocate, said state Rep. Stephanie Chang, D-Detroit. Back on the Detroit River, tractor-trailers carrying flammable, corrosive radioactive, explosive or oversized materials rumble down a dusty road onto Ward’s barge. They’re carrying whiskey from Windsor’s Hiram Walker plant, windmill parts, foundry corrosives and the like. On the hour, a tugboat, the Stormont, leaves the dock. The barge glides past blast furnaces spewing smoke, concrete companies churning rocks, and fishing boats dropping lines. Over the years, Ward says he’s become a champion of a publicly owned span not only because it would increase security and improve the flow of traffic at the Detroit-Windsor border, but also relocate residents out of Delray. Like so much in Delray these days, Ward has no idea what will happen then. How would you propose that we make steel other than flames belching out of the plant? Your bias is loud and clear. What a misleading title for this article! It should have been "Some people are happy." >>>> blast furnaces belch 30-foot plumes of fire. There are "no blast furnaces emitting 30 foot plumes of fire" or spewing "open flames into the sky" on Zug Island. While the writer may perceive that is what he is seeing, that isn't what is happening and such conduct at a steel industry blast furnace would never be allowed by either U.S. EPA or the Michigan Department of Environmental Quality. What you're seeing with the flames in the video on Zug Island are not flames released from blast furnaces. The flame sources you see are flare towers, not flaming blast furnaces. Both U.S. Steel and ESS Coke operate flare towers to dispose of gas they cannot otherwise use or during emergency conditions. Both blast furnaces and coke ovens continuously generate gas that is usually used either in firing the coke ovens or firing stoves under metal melting or other furnaces on site, or at U.S. Steel facilities in River Rouge/Ecorse, and at the DTE Energy River Rouge Power plant. explosions and harm to workers at U.S. Steel and ESS Coke. Future shutdown of the DTE River Rouge power plant, which burns coal, natural gas and syngas from coke/blast furnace, may lead to more flaring in the future unless U.S. Steel and/or ESS Coke figure out a productive way of using their gas volumes, perhaps in some kind of gas combustion turbine. This is almost certainly one of the reasons why the River Rouge power plant has not already shut down all of their units....just one remains running presently to the best of my knowledge. The Mexican community and the Black community have been replaced by urban renewal and by freeways in Detroit. There was not so much as a TV documentary and no relocation Monies offered too many of the people who had to move. Much of it was done by eminent domain. Maroon did not build a stadium with school tax money for which he gets Perpetual profits. He never close the school. He never paved over our beautiful Belle Isle to race cars on it. And he never wrote a predatory mortgage. But he's everyone's favorite Boogeyman. If maroon did not get the bridge built I doubt if you or I would. Snyder getting the bridge offers no comfort to the people of Michigan who have been poisoned by him, who schools have been closed by him, who have lost their voting rights due to his actions through emergency managers despite repealing the law. Wake up. I really thought they were buying over here Fort and Cavalry st.it is so loud you need earplugs to sleep. Stuff on my wall and shelfs keep falling.all my walls have cracks everywhere some places plaster has falling.the traffic is so bad.they bought alot of the houses over here but 6 in the area but only 2 or 3 someone lives in. I hope they decide to buy these out.